Exciting nail news! 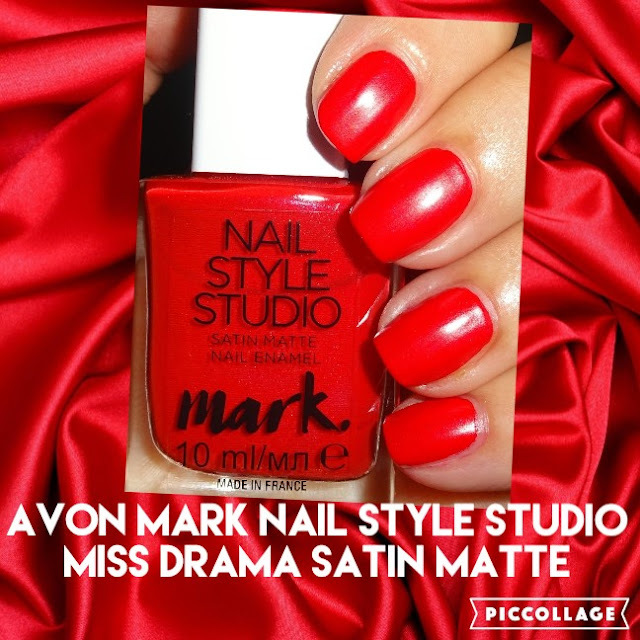 In Avon's UK Brochure 14 (2017) sees the launch of the new Mark Nail Style Studio Satin Matte nail enamel range. Ten dynamic frosted shades which dry down to a satin matte effect. It's fun to watch the enamel as it dries, turning satin matte in the process. The great thing about these polishes is you can leave as is with the satin matte finish or apply a glossy top coat which makes the frosted pigments sparkle. Super formulation and applied really well. Introducing 'Miss Drama' a saucy little red number. Photos below are with camera flash, the polish dries down with a satin sheen. Two coats for a fabulous finish. Here's Miss Drama 1) without a top coat 2) with a matte top coat 3) with a glossy top coat. 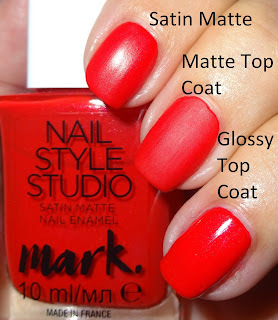 Although the difference between no top coat and matte top coat seems mild, the satin matte finish has a lustre to it whereas the matte top coat is flatter. I've also got Bronzed Babe and Hail to the Queen, gold star to the people who named the shades in this range, girl power rocks! The Mark Nail Style Studio Satin Matte range come in the standard Mark bottles, 10ml, 5-Free (free of: Formaldehyde, toluene, DBP, formaldehyde resin, and camphor). Today I'm off to Newmarket races with my devilish red satin nails, let's hope the rain holds off! Have a super weekend everyone!